"[The stars] calm each other down," Clark told SPACE.com of her new work that expands on earlier studies examining binaries. "It's like a really good marriage. They vent to each other, and they're not focused on anything else. They slow each other down and that causes increased magnetic protection of the planets." When the stars in a binary are somewhat evenly matched in mass, they can enter into a synchronized dance that keeps solar winds to a minimum. The stars also need to fully orbit one another within 10 to 30 days to expand the habitable zone. If they drift too far apart, it could put a significant gravitational strain on the orbiting planets. The magnetic fields of the planets aren't necessarily boosted in these kinds of binary systems, Clark said, but they don't have to deal with as much solar assault. Water worlds and rocky planets could form in areas of the system that might not be habitable without the double star interaction. "It also leaves the potential open for smaller planets that have less magnetic field protection to remain habitable because in a sense they don't have to protect themselves from as much as they would in a single star case," Clark said. Clark found that some "p-type" planets (that orbit both stars in a binary system) receive 30 percent less flux from solar wind than Earth depending on their position in the solar system. "Potentially, p-type binaries could have more potential for habitability," Clark added. In these systems, it's also possible that habitable alien planets could exist as close-in to their stars as Venus is to the sun. While planets that circle both well-matched stars in a binary system might have an easier time, not all binaries create this extended oasis. Planets that only orbit one star in a binary can have it rough. 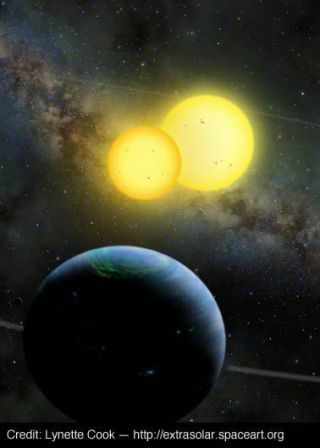 If a planet orbits the secondary star in a system, it could get a double dose of solar aggression from stars that are too far apart to synchronize. Planets that orbit primary stars in a binary, however, basically behave as any planet would in a single star system, Clark said. Editor's Note: This story was updated on June 19 to reflect a correction. The planets in a p-type binary system receive 30 percent less solar flux than a planet in Earth's position, not 0.7 percent as initially stated.